Names: Dryo- comes from a Greek word meaning tree, or more specifically oak—the same root as is found in the words dryad and druid. Pteris means fern. Expansa means expanding or spreading. Botanical synonyms include D. austriaca, D. assimilis, and D. dilatata. This species is also known as Arching, Northern, Spiny, Redwood, or Creekbank Wood fern; Northern, Alpine or Broad Buckler Fern; or Shield Fern. Relationships: There are about 250 Dryopteris sp. in the temperate northern hemisphere. They are generally called Wood Ferns, Male Ferns, or Buckler Ferns. 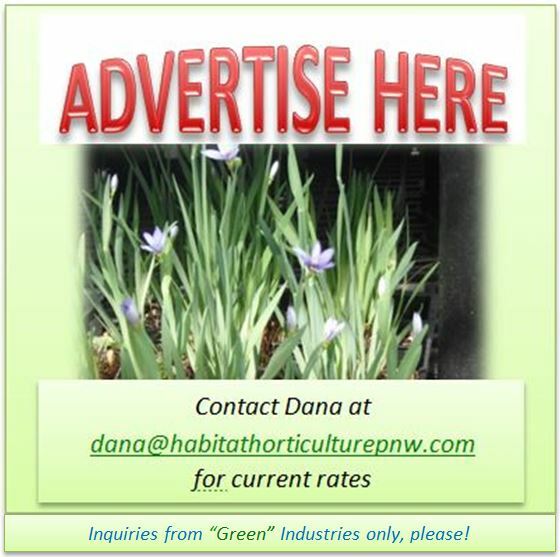 Many are popular ornamentals. About 18 species are found in the mainland United States, (several naturally occurring hybrids, too), about a dozen are native to Hawaii. Distribution: Spreading Wood Fern is native throughout much of the temperate regions in the northern hemisphere, from the subarctic to high altitudes in southern mountains. In the U.S. it occurs from Alaska to northern California, mostly west of the Cascades in Washington and Oregon; it also is found spottily in the Rocky Mountain States, in the Great Lakes region, and eastern Canada. Habitat: It grows in moist forests, streambanks, and mountain slopes. Wetland designation: FACW, It usually occurs in wetlands, but is occasionally found in non-wetlands. Diagnostic Characters: Deciduous fronds are usually clustered and erect to wide-spreading. They are triangular to oblong shaped; 2-3 pinnate. The lowest pinnae pair are usually longer, triangular and asymmetrical. Spore cases are rounded, on the undersides of pinnae. The erect or ascending rhizome often produces offshoots, which may be divided. In the Landscape: Spreading Wood Fern is easy to grow and its fine-textured, lacy leaves are ideal for a woodland garden. Use by natives: Northwest natives ate the rhizomes, baking them in pits overnight. Pounded roots were applied to cuts. The leaves were soaked and used to wash hair. Eskimos removed the chaffy covering and boiled the fiddleheads and ate them with seal oil and dried fish or in soups. The root has been used to treat internal parasites, such as tape worms. 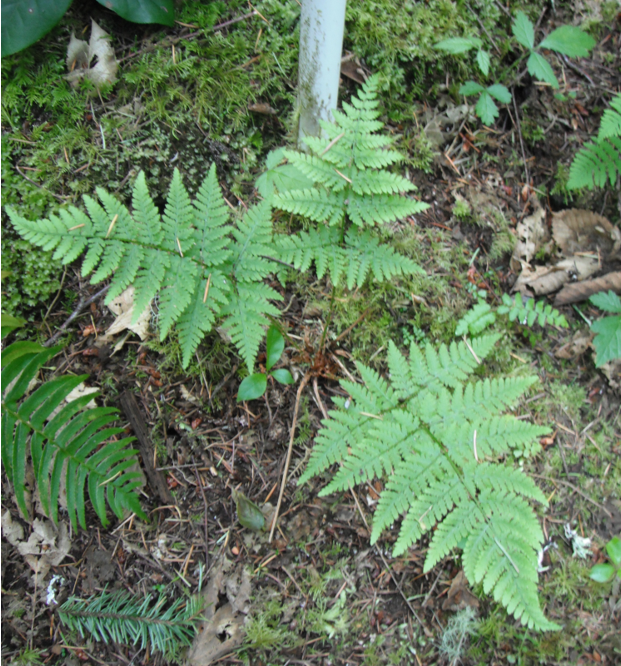 Use by Wildlife: Spreading Wood Fern is eaten in small amounts by Blue Grouse and Mountain Goats. Some Dryopteris sp. are used as a larval food plant for moths. Coastal Wood Fern, Dryopteris arguta, is more common in California and western Oregon but can be found in a few locales northwards to areas surrounding Vancouver, B.C. It is also known as Marginal Wood Fern, or Western Shield Fern. Arguta means sharp-toothed. Coastal Wood Fern grows in moist forest edges, rocky sea cliffs and drier oak woodlands. It has scale-like chaff on its leaf stalk and evergreen glandular leaves. Fronds are feather-shaped, 20-60 cm. long, 1-pinnate; deeply cut pinnae have small, tiny teeth along their margins. Spinulose Wood Fern, Dryopteris carthusiana, is widespread across temperate and arctic regions in the northern hemisphere. It is also known as Toothed Wood Fern, Narrow Buckler Fern or Shield Fern. Spinulose means having small spines; carthusiana means from the Chartreuse Mountains in the French Alps. Deciduous, 20-70 cm long, fronds are narrow and 2-3 pinnate, with the lowermost pinnae about the same length as adjacent pinnae. It is preferred moose forage. Male Fern, Dryopteris felix-mas, is common throughout much of the northern hemisphere. It is found throughout northeastern and western North America, only spottily in the Pacific Northwest. Felix-mas means fruitful or happy male. Deciduous, sometimes evergreen, non-glandular fronds are broadly lance-shaped, 20-120 cm long, and 1-2 pinnate. This very popular garden ornamental grows vase-like and withstands some drought in shade. Some cultivated varieties are available. It is often used for cut flower arrangements. It is considered poisonous, but the root has been used to expel tapeworms. This entry was posted in Ferns on November 20, 2017 by habitatdana.